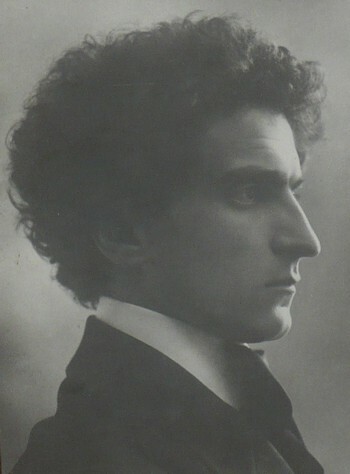 Alfonso de Pietri-Tonelli (Carpi, 1883–Venezia, 1952) was professor of Political Economy and director of Ca' Foscari (1942–1945). A revolutionary unionist and Marxist scholar, in the first years of 20th century he studied demography, criticizing the neo-malthusian theory and the idea about the birth control as an important means of improvement for the working-class life. Silve, in Trapla. Giornale Umoristico Illustrato, a.1 n.1, 1904, Carpi – below the caricatures: “Uno dei giovani lions più in voga. Capigliatura ferriana, accento dannunziano, naso diplomatico”. Unknown, in La Sosta. Giornale umoristico, 1909, Rovigo – at the bottom: «Di Tolstoj, Marx, Lassalle/ Ferri (qual fu), Sorèl,/ Hervé, Labriol, Bebèl,/ per piazza e pel canal/ andando via bel bel,/ ripassano l’ideal». Melas, in Trapla. 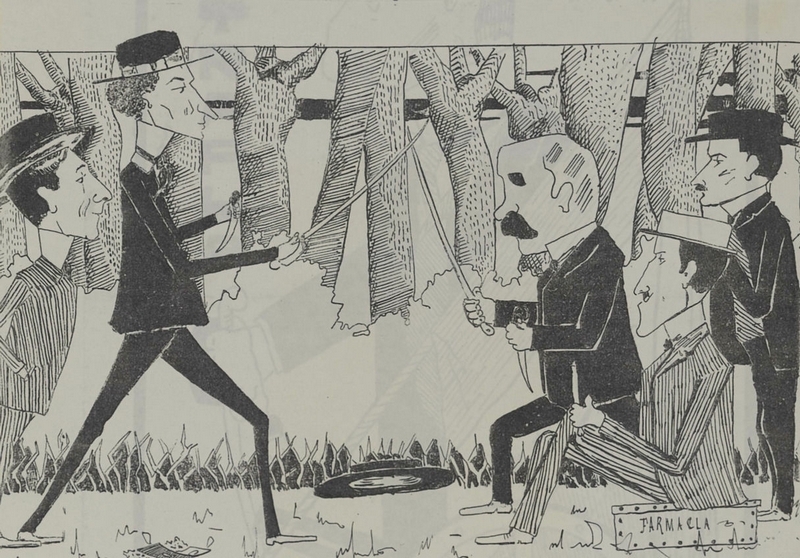 Giornale Umoristico Illustrato, a.2, n.11, 1905, Carpi – the lanky and curly-haired Alfonso de Pietri-Tonelli fights with a mustached man who has been identified with Alfonso Bertesi (a well-known unionist from Carpi; vd. M. Gervasoni, La penna e il movimento, M&B Publishing, Milano, 1998, pp.74 e 84). Before WW1 he was strongly influenced by Vilfredo Pareto, and he consequently changed his political and scientific position developing an interpretation of economic theory as a formalized science. The shift is clear in his criticism against reformist socialism, which shifted from extreme positions to liberal anti-statism. Over the following decades his studies in economic policy focused on the role of political and institutional processes in economic development, connecting the sociological aspects of Pareto’s élite theory to economic modifications and introducing a mathematical model to measure their interaction. His most renown works were however the ones on stock-exchange speculation, which mechanisms he theoretically explains in detail; the first publication on this topic is dated 1913 (but several reprints and new editions followed). 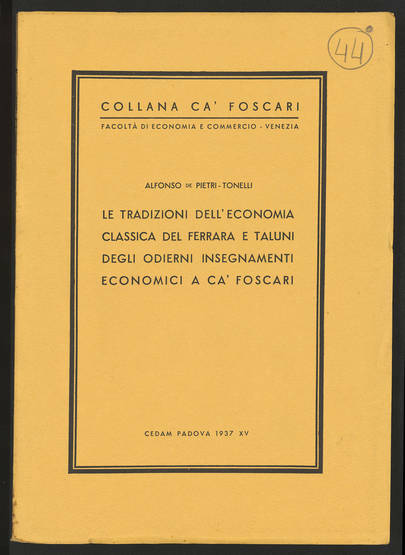 In his works in the History of Economic Thought, he promoted the connection between the Pareto’s school and the Ca’ Foscari classical free-trade tradition represented by Francesco Ferrara and Tullio Martello. In 2009 Pietro de Pietri-Tonelli, Alfonso's son and heir, donated the library (around 4000 books) and the archive of his father to Ca' Foscari University, in particular to the Economics Library in San Giobbe. The archive is made up of all the published material (books, journal, fragments of newspaper) signed by Alfonso de Pietri-Tonelli or regarding to his works, and of other documents such as drafts, typewritten documents, copies of letters. Since summer 2018, BEC has started a project for publishing online all the monographs by Alfonso De Pietri-Tonelli. Day by day the collection will be enriched with documents and other sources linked to his main works: reviews on his production or articles or reviews written by himself both on the subjects studied as academic and on the topic about current issues. Further information, bibliography and a complete list of the archive are available online (in Storia e collezioni). 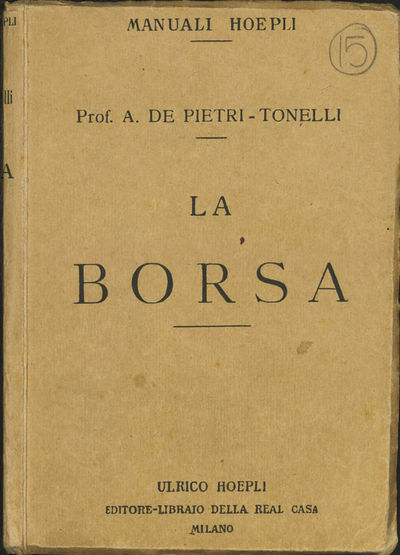 On Alfonso de Pietri-Tonelli see the record edited by Denis Giva in Dizionario Biografico Treccani (1991). in Bollettino n.s. 3 (dicembre 1963) in "Vita di Ca' Foscari" a long article (pp. 58-62) cites the Alfonso de Pietri-Tonelli's commemoration which took place on the 6 of December in Ca' Dolfin.